North Korea’s multi-stage long-range rocket test on 7 February, coming soon after its fourth nuclear weapons test in January, has drawn condemnation from the international community. North Korea’s previous nuclear test in 2013 drew censure from the United Nations Security Council in the form of UNSC Resolution 2094. Over the past two decades, North Korean provocations have elicited strong rhetorical responses from the international community. These have not been matched by the tangible responses of the UNSC, which have tended ultimately to settle on incremental additions to existing sanction measures. Yet, the UNSC sanctions against North Korea failed to achieve their denuclearisation objectives and there continues to be dissonance between these objectives and the obligations expressed in the resolution’s text. UNSC Resolution 2094: ineffective by design? The sanctions regime of UNSC Resolution 2094 is problematic at both the sender and target ends of the process. On one hand there is a significant gap between the objectives contained in the resolution and the strength of its enforcement mechanisms, and on the other the balance of incentives for the North Korean government favours non-compliance with the sanctions regime. Enforcement of the sanctions regime against North Korea is further complicated by three primary factors: the lack of a punitive ‘big stick’, lukewarm Chinese participation, and creative sanctions busting by the North Korean government. In the absence of an international sovereign authority, the compliance of member states with UNSC resolutions is a product of their willingness to acquiesce to and carry out the provisions contained therein, along with the ability of the UNSC to enforce its resolutions directly in the absence of consensus on military action. The competing economic interests and strategic objectives of sender states often lead to patchy commitment to their enforcement. Furthermore, sanctions enforcement requires the active cooperation and participation of all UN member states beyond the UNSC, along with numerous non-state actors, many of which do not share the interests and goals of the primary sender states. The legitimate authority of the UNSC articulated in the UN Charter is therefore insufficient as an enforcement lever. The credibility of UNSC sanctions against North Korea is hampered by two significant obstacles: the unique constraints on the use of military force posed by South Korea’s strategic vulnerability to North Korean attack and China’s role as a potential veto power within the UNSC. In the case of the Korean Peninsula, military intervention is an impractical enforcement strategy for clear geostrategic reasons: Seoul is essentially indefensible against North Korean rockets and artillery due to its close proximity to the demilitarised zone. The risk is too high to justify the desired gain. This leaves non-military measures as the default suite of enforcement mechanisms available to the UNSC. In terms of China’s role, as North Korea’s largest trading partner – constituting 89.1 percent of the DPRK’s foreign trade – it theoretically has the greatest leverage over Pyongyang. However, the Chinese government has often cited strategic reasons for treading gently with sanctions enforcement: North Korea forms a key component in a series of buffer zones surrounding China’s territorial periphery. A buffer zone becomes a strategic liability if it becomes politically unstable. China fears the potential for economic and social dislocation in its north-eastern provinces caused by large refugee flows from North Korea in the event of a war or state collapse. For these reasons, the Chinese government has tended to exert a moderating influence on UNSC resolutions aimed at the DPRK and taken a relatively relaxed attitude to enforcement. Its veto power in the UNSC means that other sender states have to live with Beijing’s moderation of resolution texts and patchy commitment to enforcement if they want it to support sanctions resolutions at all. From the perspective of the North Korean government, there is little incentive for it to accede to the sanction measures and the associated denuclearisation agenda. The DPRK has been able to skirt limitations put on it by sanctions by using individuals based in foreign companies and channelling funds through small accounts across several banks to avoid activating due diligence processes. Moreover, sanctions allow the Kim regime to present itself as a pillar of national resistance against foreign aggressors, who can be blamed for the scarcities and privations of the sanctions regime. Pyongyang’s expectation of future conflict with the USA far outweighs the benefits of cooperation. Acceding to Washington’s demands would weaken its negotiating position and its strategic defensibility in future interaction. Its record of defiance of UNSC sanctions strongly supports the proposition that relative-gains calculations trump the possible rewards for compliance. Furthermore, full compliance would entail swapping a tangible strategic asset in its nuclear deterrent for a paper security guarantee from the USA and regional states. Because of this, the North Korean leadership intends to accelerate the pace of proliferation in order to bring the nuclear and missile programs to maturity, with a fully operational nuclear deterrent in place to provide the security umbrella under which new economic measures can be rolled out. Therefore, in order to comply with the UNSC sanctions regime, Pyongyang would have to abandon not only its strategic deterrent, but also the foundation of its medium-term economic development strategy, the pillar of its institutional governance structure, and its associated ideological and anti-American propaganda. Compliance measures in the sanctions regime would have to be far stronger than they are currently, and have complete buy-in from all sender states, in order to even begin to alter North Korea’s current position on denuclearisation. 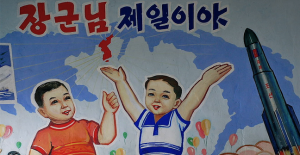 Despite some small wins with UNSC sanctions – such as deterring other would-be proliferator states and perhaps slowing North Korea’s nuclear development – the flawed denuclearisation agenda embodied in the UNSC sanctions regime against North Korea risks exposing the limitations of the USA’s strategic leverage in North-East Asia during a period when the hegemonic contest between China and the USA is heating up. This article was originally published in Australian Outlook, official blog of the Australian Institute of International Affairs. It is adapted from his article “The enforcement problem in Resolution 2094 and the United Nations Security Council sanctions regime: sanctioning North Korea” published in the Australian Journal of International Affairs in February 2016. He will be speaking in Melbourne next week at an AIIA event, “Social Swings and Nuclear Roundabouts, North Korea in 2016″.